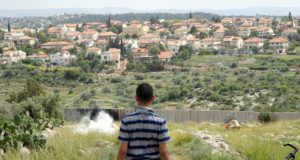 On the 1st August, Palestinian protesters, joined by Israeli and international solidarity activists, marched to the construction site of the apartheid wall in Ni’lin. Well over 100 meters of barbed wire at the site was eventually removed from the construction site and placed in front of the bulldozers so as to delay planned work on the wall the following day. This action was similar to the one that saw 10 year old Ahmed Mousa killed by Israeli forces on the 29th July. Five Palestinians and two internationals were then injured by rubber-coated steel bullets as Israeli forces attacked the demonstration. and invaded the village. 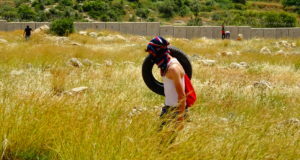 As the Israeli army withdrew from the village, protesters regathered and marched back to the construction site and finished moving the barbed-wire so as to hinder the building of a wall that will seize over 2500 Dunums of Ni’lin’s land. This action came in the aftermath of the killing of Ahmed Ussam Yusef Mousa, 10 years old, who was shot with live ammunition through the head from close range by Israeli Border Police. Yousef Ahmad Younis Amira, 17, was then shot in the head with a rubber-coated steel bullet in a protest after the funeral of Ahmed. He was declared brain-dead by doctors in Ramallah that night. He is still in Ramallah hospital, but is not expected to survive the next few days. Today, a memorial was built where Ahmed Mousa was killed. A Palestinian flag flies from the top. 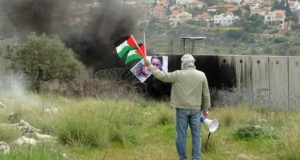 Demonstrations have been held almost every day for the past few weeks in Ni’lin against Israel’s annexation barrier, declared illegal by the International Court in the Hague in 2004.